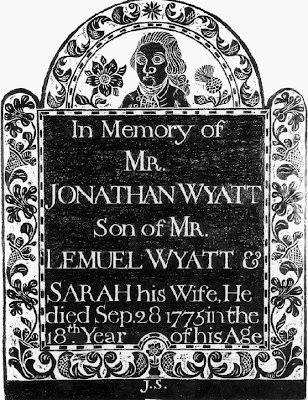 I have never done a gravestone rubbing and generally consider myself to be opposed to the practice. 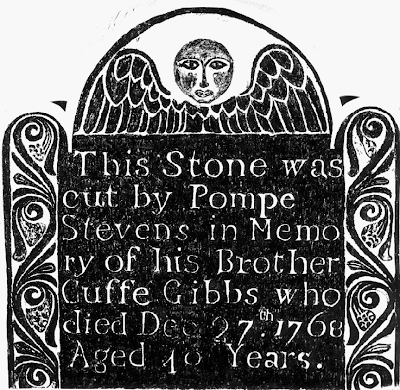 Perhaps this is because I got my start in gravestone studies in Northeastern Connecticut, where many of the gravestones are made of delicate red sandstone and rubbing is absolutely forbidden due to their fragility. Yet, I must concede that a good gravestone rubbing is a thing of tremendous beauty. I once saw a rubbing of the Charles Bardin stone that nearly took my breath away — the technique made the image of God seem to be bathed in light rather than surrounded by monotone slate. Of course, the very act of rubbing may be partially responsible for the current state of the stone, which is why I do not advocate taking rubbings. On the other hand, if it is done professionally, it can be a useful preservation tool. The Farber Collection does not say when their photos/rubbings were taken (one of the many annoyances of using that collection), but the introductory essay mentions that some of their images are Forbes' work, and it wouldn't surprise me if most of the rubbings were hers. I can appreciate these beautiful reproductions, but I'm not sure that the good outweighs the possibility for harm. For now, I'll stick to photographs. A rubbing made by a real expert is indeed both a work of art and a valuable historical document. It can pick up details that a photograph can miss, and it has an immediacy (especially with respect to size) that photographs often lack. I almost wish important cemeteries would have expert rubbings made of all their stones once, for documentary purposes, and then forbid the practice. Yes, I did gravestone rubbings when I was a kid, and it was fun, but I just don't see that it can be justified any more on very old stones. Kids can still do it in modern cemeteries, on twenty year old granite stones.